Rentable advertising board with online indicator, pager buttons, and more! Rentable advertising board, allow your visitors to rent ads on your sites! All automated: helps advertisers set up, sends rent reminders & autoevicts. Optional 'pager' & 'map' button (TPs people to advertisers) & IM notifications. Displays multiple advertiser textures as a slideshow, and many more features! Copyable: rez as many as you like, modifable, size and configure as you wish! The Bright Advertising Board allows visitors to your sites to rent advertising. If you run a venue which attracts visitors, and it would be helpful to earn some revenue to help cover the cost of the tier, or already run a store and wish to enhance the revenues it makes, allowing your visitors to rent advertising space is an excellent way to do it: and allowing them to rent advertising space on a Bright Advertising Board maximises the benefit to both you, and your advertisers. MAKE AS MANY COPIES AS YOU WISH! BUY ONE, INSTALL DOZENS! Run by only one script - low memory, low lag! To unpack, drag the "Bright Advertising Board boxed" object from your inventory onto the ground to rez it. Right-click the box, click "Open" from the popup menu, and click the "Copy to Inventory" button at the bottom of the contents window displayed. 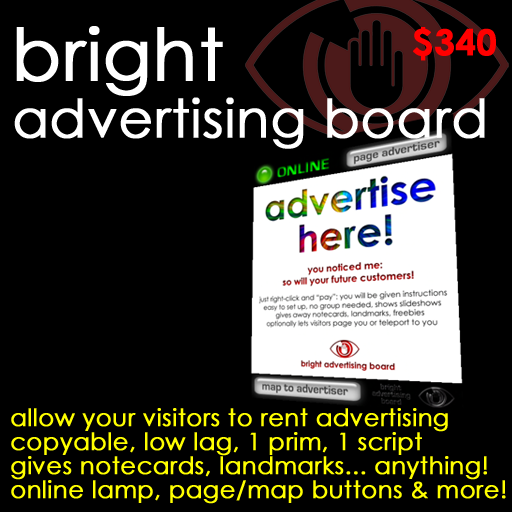 This will create a "Bright Advertising Board boxed" folder in your inventory, containing the "Bright Advertising Board" itself, and the user guide. Drag the Bright Advertising Board onto the ground. Right-click the board, and click "Open" on the popup menu. A contents window will appear, showing you what is inside the board: one script, and a notecard called "Bright Advertising Board settings". Double-click the settings notecard to edit it. rent|50 - Change the 50 to weekly rent you wish to charge advertisers for using your board. The next three settings are easier to understand if you think of the board as advertising *itself* whenever it is not being rented by someone else. In the same way that advertisers can configure the board to send them notification of clicks, display a pager button, and display a map button, you can use these settings to decide whether you wish these features to be switched on while the board is *unrented*, and *you* are therefore the advertiser. Note that enabling or disabling these features while the board is unrented will not effect their availability when it is rented: other advertisers can still switch them on and off during their rental using their control menu (see below). notify owner|yes - While the board remains unrented, it will display the message "advertise here". If you wish to be notified whenever someone clicks this for more information, leave this at "yes" - otherwise change it to "no". Whether this is yes or no, you will always be notified when advertisers actually rent your board. owner pageable|yes - The board is that it can dispay a "page advertiser" button to allow people to send a "you are being paged" IM to the advertiser renting the board. If the board is unrented, and this setting is "yes", the "page advertiser" button will still be displayed, and people can use it to page *you*. If it is "no", the button will not appear while the board is unrented. owner location|Mizar,32,32,2000 - The board can also display a "map" button, which opens a Second Life map window offering a "teleport" button. If you would like a map button to appear while the board is unrented, replace "Mizar,32,32,2000" with the coordinates you would like the map to show, in the form "region,X,Y,Z". If you don't want a map button displayed while the board is unrented, leave this line blank after the "|". managers|Shan Bright - As the board's owner, you can use it's control menu whoever is renting it. If you would like to appoint "managers" who will have the same authority, replace "Shan Bright" here with their names separated by commas: eg. "Jane Doe, Joe Bloggs". If you have no managers, leave this line blank after the "|". When the board is rented, the main texture it will show will obviously be the one chosen by the advertiser - but the "system" textures which the board show when it is unrented, or which it uses to show buttons and other details, can all be changed. There are nine system textures, listed below. If you are happy with the ones provided, leave these set to "default". If you would like to change any of them, right-click your chosen texture in your inventory, and click "Copy Asset UUID". This will copy the textures "key" into your text buffer (here is an example key: "71ebe225-3f80-f498-bf46-83bfba3f9379"). Then replace the word "default" with this key. The default textures will all work perfectly well, so there's no need to change any of them if you are happy. vacant texture|default - Board unrented - "advertise here"
rented texture|default - Board rented but not empty - "reserved"
online texture|default - Advertiser online, paging off - "online"
offline texture|default - Advertiser offline, paging off - "offline"
page texture|default - Advertiser online, paging on - "online - page advertiser"
message texture|default - Advertiser offline, paging on - "offline - leave message"
info texture|default - Map disabled - "click for information"
map texture|default - Map enabled - "map to advertiser"
add texture|default - Advertiser adding items - "control+drag items here now!" Once you have finished editing the notecard, click the "Save" button, and the close both the notecard and the contents window. JUST RIGHT-CLICK AND 'PAY' TO RENT FOR $50/WEEK! You will be told how to add textures and things to give away: notecards, landmarks, freebies... It's easy! If you like, the board can even IM you when clicked, COUNT clicks, show SLIDESHOWS, let visitors PAGE you, & offer a TELEPORT MAP to your site! This is the message which anyone else clicking the board will see too - except that they will *not* see the [Reset board] button - that is only for you and your managers. Click it to reset the board so your new settings take effect. If you wish to set up a lot of boards configured the same way, this might be a good time to right-click your board and click "Take copy", saving all your changes. And that's it - your board is ready to rent! Don't forget your board is modifiable - you can edit it using Second Life's ordinary editing tools to any shape and size you need. This is all the easier because it is only one prim. The first thing you may wish to change is the name of the board: this will appear in messages to its users, and will determine the name of folders given out. To change the name, right-click the box, click "Edit", select the "General" tab in the edit window, and change the "Name:". Straight out of the box, the board has a 3m x 3m square central panel, plus narrow panels above and below for online information and buttons. If you'd like it bigger or smaller, right-click, click "Edit" on the pop-up menu, hold down Control+Shift, and drag one of the little white cubes which appear in the corner in or out. The while board will grow or shrink, while retaining the same proportions. If you'd like it wide (landscape) or narrow (portrait), again hold down Control+Shift, but drag the little green cube at the top upwards to make it taller, or one of the little red cubes at the side to stretch it wider. Experienced SL builders can also experiment with changing the dimensions, thickness, taper... whatever suits them. If you go wrong, just delete the board and drag another one from your inventory! Your advertisers don't need to read this notecard - or any notecard. The board will guide them through the rental process step by step. This information is provided for your information - but if you like, go ahead and rent the board yourself! Your payment will go straight back into your account, so it won't cost you anything, and you'll be able to see how the system will work for your advertisers. To rent the board, right-click it, and click "Pay" from the pop-up menu. You will see a payment menu with four buttons: for one week, two weeks, three weeks and for weeks. If you have set the rent at $50/week, they will be labelled "$50", "$100", "$150" and "$200". Click one to make a payment. John Doe: $50/wk, 7 days left, 0 clicks. 0 item(s), including 0 texture(s) & 0 landmark(s). The advertiser can click the board to redisplay this menu at any time during their rental, to change their settings or count the number of clicks they've had. Note that you and your managers will also see this menu when you click the board, allowing you to configure or even end the rental. Many advertisers will not need help, being familiar with the way advertising boards work: but for those who need it, clicking [Help!] will display the following information. Thank you for renting this Bright Advertising Board. [Test board] See what messages and items visitors receive when they click. [Add items] Start adding items. Textures will be displayed (in a slideshow if more than one) and other items will be given to visitors. Once you've clicked this button (1) open your inventory (2) hold down your control key (3) drag items over the board, and (4) drop them when it glows red. Items must by copy/trans. [Clear items] Remove all items from the board (so you can add new ones). [End rental] End your rental - please note that the board cannot pay refunds. [IMs on/off] Switch on and off IMs notifying you of clicks. [Pager on/off] Show or hide a 'pager' button at the top of the board. If visitors click 'page', you will receive an IM telling you who is paging you and from where. [Map on/off] Show or hide a 'map' button at the bottom of the board. If visitors click 'map', they will be shown a teleport map to your site. The location is taken from the (alphabetically) first landmark you have added. [Folder on/off] Enable or disable folders when giving items to visitors: if enabled, visitors will receive everything in a folder, if disabled, they will receive items one by one. Only useful if you are giving out more than one item. [Clear counter] The menu shows the number of times the board has been clicked since you rented it. Click this button to reset this counter. [Reset board] Resets the scripts inside the board (without losing your advertising data). Usually only used by the board's owner. Hold down your Control key. Drag items over this board. Drop them when it glows red. Include at least one texture. Include a landmark if you want a TP map. This message will appear on the board for 30 seconds, with a countdown. At the end of 30 seconds, or if the user clicks the board because they have finished adding items earlier, the board will reset. It will display the texture they have loaded (or if they have loaded more than one, a slideshow of these textures), and give away any non-texture items (landmarks, notecards, freebies, anything) when visitors click it. Note that in order to allow the board to give multiple items away, they must be copyable and transferable. The most commonly added items (landmarks, notecards and so forth) are full perms, so this is seldom a problem: but if a user adds a no-copy, transferable item, it will be automatically returned. In the unlikely event that they add a no-copy, no-transfer item, they have unfortunately lost it - as by definition, these permissions mean that the object cannot be returned. However, this would be true of any advertising board. The menu above will also reappear, allowing the advertiser to add more items if they wish to, or configure other settings. The rentals are managed automatically. Advertisers receive daily warnings by IM for three days before their rental expires: if they still do not pay and their credit runs out, the advertising board will automatically clear it's contents and revert to being available for rent, with the original "advertise here" texture.